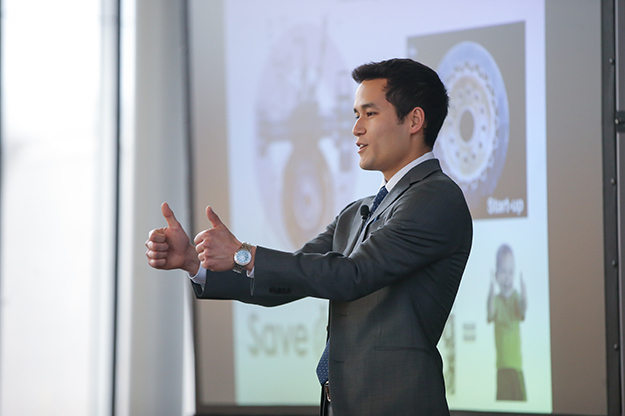 Matt Fuka, a master’s degree student in mechanical engineering, won both second place and People’s Choice awards at UND’s Three Minute Thesis (3MT®) competition, which allows graduate students to focus on communication skills. Photo by Shawna Schill. Matt Gilmore knew he was onto a good thing when he learned about an Australian university’s Three Minute Thesis (3MT®) competition for graduate students that focused on communication skills. With his colleague Chris Nelson, a faculty member in English — part of the UND College of Arts and Sciences — he organized UND’s very first 3MT competition, held at the Gorecki Alumni Center earlier this month. Gilmore and Nelson recruited several teams of volunteer judges from among UND faculty, students, and community members. Six students out of 24 competitors advanced from the preliminary competition last Friday to Monday’s final round at the Gorecki Alumni Center. UND President Mark Kennedy and Provost and Vice President for Academic Affairs Thomas DiLorenzo were on hand to congratulate the winners. “The skill that this competition encourages is one of the most vital career skills that you can develop,” said Kennedy, noting that he advanced early and fast in his corporate career by being able to deliver crisp, clear communication on technical subjects. He addressed the audience during the awards event. Brooke Hagenhoff, a master’s degree student in atmospheric sciences, won first place. Matt Fuka, a master’s degree student in mechanical engineering, won both second place and People’s Choice awards. DiLorenzo echoed the student perspective on the competition during his award ceremony remarks. Brooke Hagenhoff (right), a master’s degree student in atmospheric sciences who took first place in the Three Minute Thesis (3MT®) competition, poses alongside competition runner up, Matt Fuka. Photo by Shawna Schill. The contest was about students addressing non-specialists with compelling stories about their research in three minutes or less. 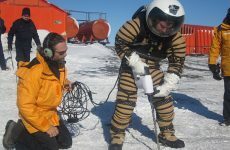 Communicating science is a key interest of Gilmore, an associate professor of atmospheric sciences in the John D. Odegard School of Aerospace Sciences. 3MT helped in that effort, says Gilmore. In addition to their supporting visual, competitors were judged on how well they captured the attention of the audience, how engaged they were with the audience, how much energy they brought to the presentation, and how clearly they articulated their ideas. The 24 competitors were selected by their graduate program directors in academic areas ranging from English to engineering. Many had practiced and received feedback from trainers and fellow students over the past five weeks. Altru Manager of Primary Care Programs Michael J. 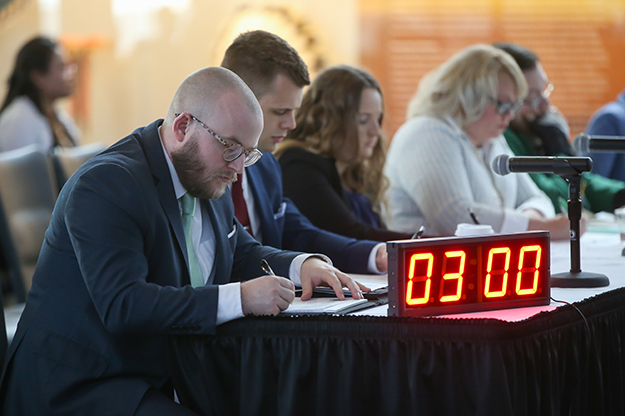 Little (foreground) joins Student Body President Brandon Beyer and other volunteer judges who were recruited from among UND faculty, staff, students, and community members for the Three Minute Thesis (3MT®) competition. Photo by Shawna Schill. This is a growing and significant competition throughout the world. It was originally developed by the University of Queensland (Australia). It is especially important as an act of public scholarship highlighting the exciting research of our graduate students to various UND stakeholders. 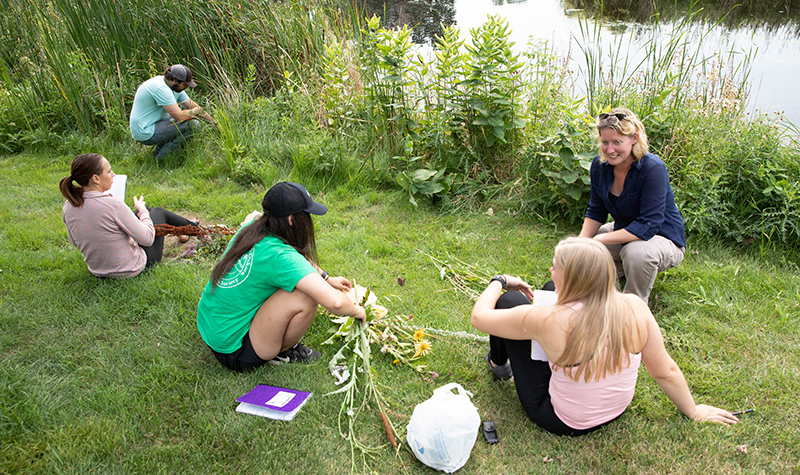 In addition to enhancing the students’ ability to communicate the importance of their research to various publics, the competition also provides incentives for participation, including cash awards provided by UND’s School of Graduate Studies. 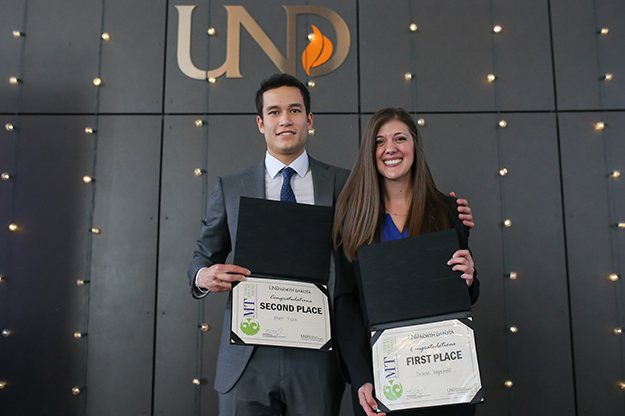 The UND 3MT® was cosponsored by UND School of Graduate Studies and the Division of Research and Economic Development. Gilmore and Nelson say they plan to stage another round of 3MT competition next year.